The Pacific island of Guam will become an additional launch site Virgin Orbit's LauncherOne service. With the site's remote location and close proximity to the equator, Guam serves as an excellent base of operations from which the company's unique, 747-launched rocket can efficiently serve all inclinations, a boon to the rapidly expanding small satellite market. Most excitingly, the new location enables LauncherOne to deliver more than 450 to a 500 km. equatorial orbit. The addition of Guam to that list enhances the flexibility of Virgin Orbit's launch operations, adding a low-latitude site with clear launch trajectories in almost all directions, giving Virgin Orbit's customers unparalleled control over where and when their small spacecraft are deployed. 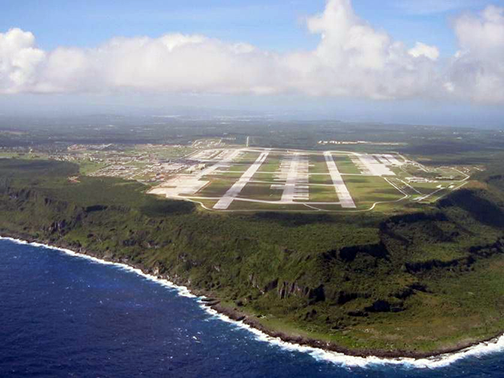 Aerial photo of Anderson Air Force Base in Guam. Officials at U.S. Pacific Air Forces (PACAF) have issued a letter of support for Andersen Air Force Base to host launches and other exercises with LauncherOne and its dedicated carrier aircraft's critical step en route to a first launch from the island, which could occur in as little as a year's time. Additionally, the largest commercial airport on the island, A.B. Won Pat International Airport, has begun the process of seeking its launch site operator's license from the Federal Aviation Authority's (FAA) Office of Commercial Space Transportation, in order to serve as a future launch site for Virgin Orbit. Virgin Orbit CEO Dan Hart said that launching from Guam gives the firm easy access to every orbital inclination customers need. With the company's air-launched system, Virgin Orbit's LauncherOne will fly out as any other airplane, move out to sea and release the rocket. This minimal footprint, coupled with Guam's natural launch location, results in a great match. With the continued support from Guam's Governor Leon Guerrero and the firm's partners in the DoD, Virgin Orbit is well on the way toward providing new launch opportunities for small satellites that have waited too long for their ride to space. Virgin Orbit's LauncherOne system is now in the final phases of testing, after successfully demonstrating all major assemblies with multiple flight vehicles in production. Having just completed its fourth captive carry flight with a test rocket mated to the wing, Virgin Orbit is on track to conduct its first orbital test flight later this year. 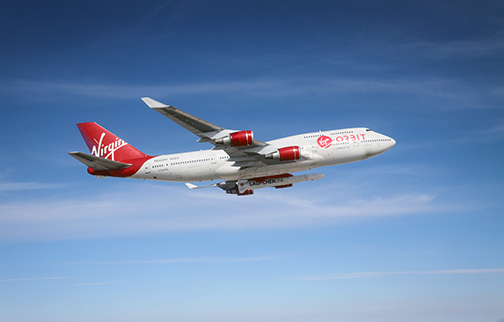 By using a customized 747-400 aircraft as its "flying launch pad," Virgin Orbit gains the ability to quickly transport the entire launch site to new locations around the world, launching each satellite from the optimal location. This mobile approach to launch substantially reduces the expense required for infrastructure at each launch site. In addition to the Mojave Air and Space Port — the California launch site that will be home to the company's first orbital launch in the middle of this year, as well as subsequent launches to high inclination orbits — other spaceports new and established have announced that they are working to prepare themselves for future missions of LauncherOne, including the Launch and Landing Facility at the Kennedy Space Center in Florida, Spaceport Cornwall in the United Kingdom, the Taranto-Grottaglie Airport in Italy, and others. Guam's Governor, Lou Leon Guerrero, added this is a rare opportunity for the island to be front and center of a groundbreaking space industry. Guam has always been a rare gem known for great weather, a beautiful landscape and warm people can now add space transportation to that list.